The Roulette Wheel - How to worry the casino! Roulette is a game of chance. It uses a spinning wheel with either 37 or 38 numbered pockets. The wheel is spun one way and a ball is sent round the other way. Before the wheel is turned, players bet on where the ball will land. There are lots of different ways to do this, and the chances of winning and the payouts vary. However it doesn't matter if you're in a real casino or playing at a casino from a best online roulette list, the rules will be pretty much the same. 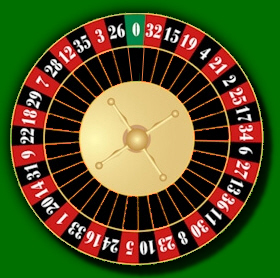 The first recognisable roulette game was played in a Paris Casino in 1796. The game is designed to give the casino an edge - in other words, over a long time players should lose slightly more than they win. That's how casinos can afford to have lots of smart people in suits standing around saying "Good evening Mr Bond". Unlike Mr. Bond however, the casino is not always invincible. We're going to look at the maths behind roulette, and how new online casinos such as the ones listed at TheCasinoDB gain their advantage and how you can gain yours! 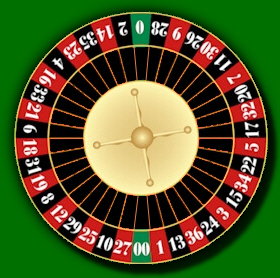 Most European roulette tables have 37 holes numbered 0-36. The 0 is coloured green, the other numbers are red or black (18 of each). 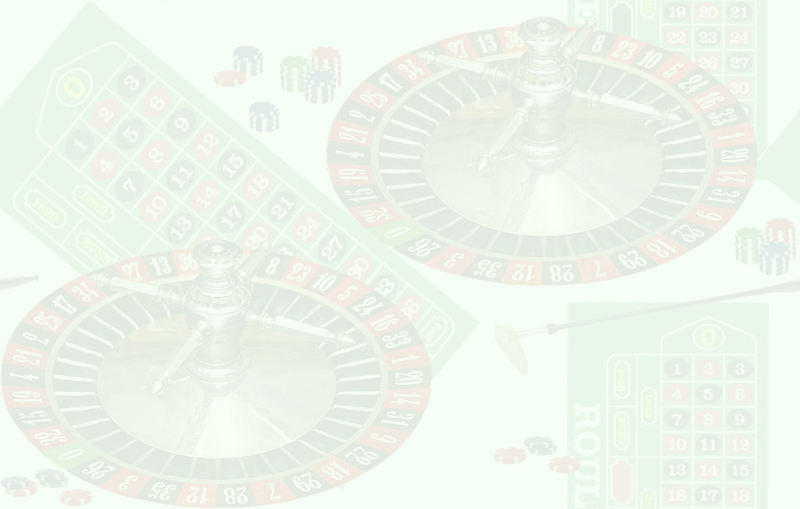 Examples of places to play online roulette can be seen at the Online Gambling Bible site. One bet is to pick any single number. This pays out 35/1. Therefore if you put �on it and your number comes up, you will receive your winnings of � plus your original �= � in total. However the chances of winning are 1/37 because there are 37 numbers and only one winner. This means if you play 37 times, it will cost you �, and on average* you should win once which will give you �. In other words, if you play for years and years, for every � you bet, you'll get back �. The simplest way to show this is to put �on every number, so that's � in total. Spin the wheel. The winning number will give you � back, the rest all lose, so you're �down. The house wins �out of every � bet which is 2.7%. It might not sound like much, but when big money is flying around, it soon adds up! * There is NO guarantee you will win one time every 37 games! You might not win any, or if you're very lucky you might win two or more. It's like throwing a dice six times. On average you should get one six, but you might get more, or you might get none. Another common bet is Red/Black. This pays out 1/1 (or evens), so if you put �on red and it wins, you get �plus you get your original �back = �in total. Your chances of winning are 18/37 because there are 18 red numbers out of the total 37. If there was no ZERO hole, then the chances would be 18/36 = 1/2. It would be an even bet and you should win exactly as much as you lose. However the ZERO will come up about 1/37 times, so neither red or black win. Once again, this gives the house a 2.7% profit. Among the various games at casinos online or offline to choose from generally UK players prefer blackjack, roulette and table games. In Australia however the players there prefer playing online pokies (how they call slots in Australia). Not everyone can work out the odds of winning at casino games, but if you put the maths aside and just play for the fun element and hope Lady Luck is on your side, then you will be able to enjoy a wealth of exciting online casino games right here. Players put their bets on a cloth known as the layout. Here we've put a selection of markers out. The table shows the chances of winning, and the payout. ZERO is not odd or even, and is not black or red! 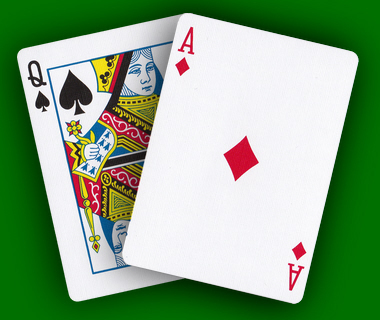 If the European tables didn't have the green zero pocket, then there would be no profit for the Casino. American tables have a second green pocket, the double zero. This doubles the profits! Some places do play special rules regarding these zero pockets, e.g. if you bet on all the odd numbers and zero or double zero comes up, they only take half your money. ZERO and DOUBLE ZERO are not odd or even, and are not black or red! Answer: You don't - well not for certain! There are stories of people who have won at Roulette but for everyone that wins, there are lots more who lose! Of course, there's fun to be had in trying a "system", so even if you lose a little bit, you've enjoyed yourself. In the old days, some gamblers used to watch the same roulette wheels week after week, and very occasionally would notice a "bias" which made the wheel favour some numbers slightly more than others. By continually betting on these numbers, the gamblers turned the odds in their favour and started to win - until the management realised and mended the wheels. Happily these problems don't occur with the games featured on Casino Reviews. The main rule about winning or losing is that you must set yourself a limit of how much you're happy to lose, and if it all goes then STOP! SO HOW DO YOU WORRY THE CASINO? That's what we put at the top of this page, and there is a method! You bet �every time, putting it on red/black or odd/even. You put all your �0 on one number for just one turn of the wheel. If you play �a time for ever and ever, very slowly and surely your money will go, but if it's a nice place, then maybe it's worth it. And the casino will love you because even if you do happen to get ahead and then stop, it won't cost them much. Of course if you put all your �0 on one number, you will probably have a very short visit... but the Casino will worry! That's because if you DO win it'll cost them �500. They won't like that! So if it makes the Casino worry, then it has to be better for you! Blackjack - Hit or Stand?